MOSCOW — Russia’s only aircraft carrier was damaged in a dock accident Tuesday that left one person missing and four injured, officials said. A floating dock sank early morning in Murmansk, dropping a crane on the deck of the Admiral Kuznetsov carrier, the United Shipbuilding Corporation said. The corporation’s chief, Alexei Rakhmanov, said the 70-ton crane left a hole of 215 square feet, but added that it didn’t damage any of the ship’s vital systems. The accident happened as the ship was leaving the dock following repairs. Rakhmanov said it may have been caused by a sharp power surge that led to pumps' failure. The Russian naval grouping is led by the Northern Fleet’s guided missile cruiser Marshal Ustinov. Four workers were injured and one is still missing, Murmansk governor Marina Kovtun said on state-owned Rossiya 24 television channel on Tuesday. Rakhmanov said that accident wouldn't lead to a significant extension of the carrier's refurbishment. Following the repairs, the carrier is to be fitted with modern control systems and new weapons. Rakhmanov acknowledged, however, that the loss of the huge, 80,000-ton dock would disrupt the planned modernization of other Russian navy ships. The dock is the only structure of that capacity that Russia has, and it wasn't immediately clear whether it could be lifted. 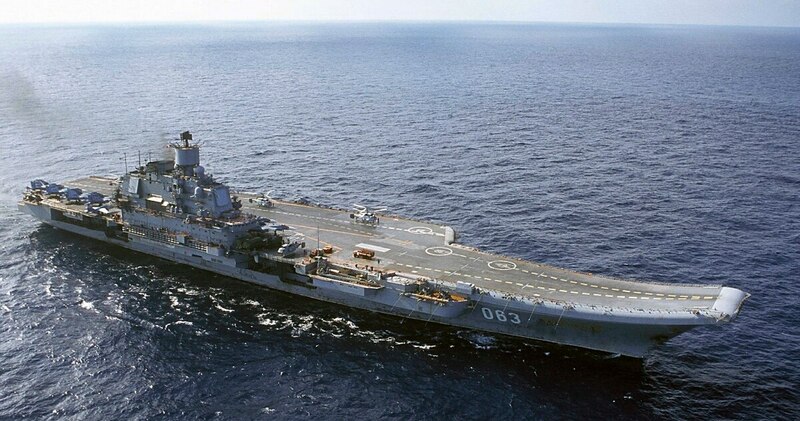 The Admiral Kuznetsov carrier was launched in 1985 and has repeatedly been plagued by technical problems. While the ship with its turbines belching black smoke looks outdated compared with the U.S. nuclear-powered carriers, it allows the Kremlin to project power far away from Russia's shores. Two years ago, the Admiral Kuznetsov was deployed to the eastern Mediterranean as part of Russia’s campaign in Syria, launching the first carrier-mounted attacks in Russia’s navy history.